Read David's March 2019 Choral Journal article for further information for ensemble singers and leaders. At voicescienceworks.org we focus on warm ups with a purpose. Our approach focuses on individual vocal growth as the central focus for ensemble development. This is especially important when working with groups of singers where the singer must be responsible for their own learning through the use of clear goals and personal feedback. Establishing exercises with defined targets is key. We prefer repetition and student feedback to pyrotechnics and pushing the range. The BBC article "What It Takes To Stand Up To Authority" underscores two concepts that help to focus this idea. 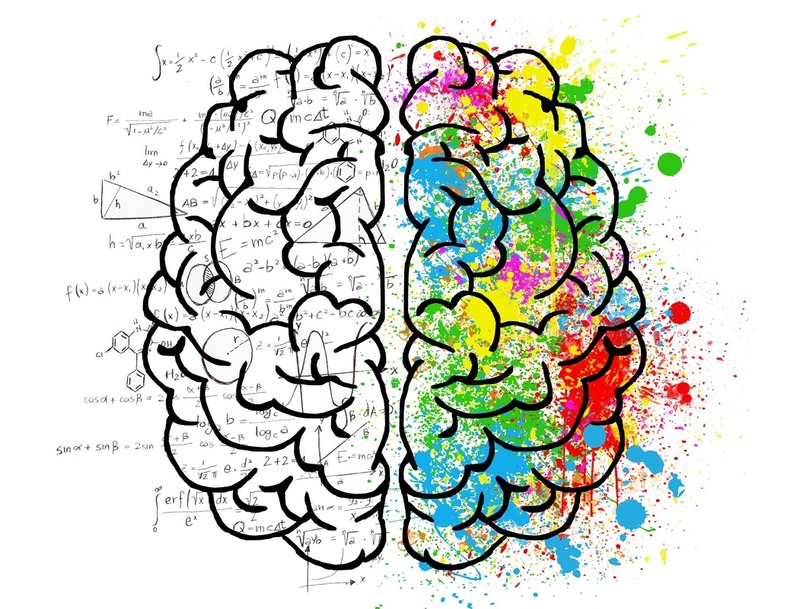 1) people respond to authority with a different part of their brain than they do when puzzling out ideas for themselves and 2) people will participate to please a group without considering what they are doing. In order to help singers find their voices, we feel the need to actively structure singing spaces so that singers can engage in their learning without having to work against their authority receptors. Mental calm, on the breath, and 5.4.3.2.1. Have singers sit with their feet flat on the floor, with their hands resting on their knees and palms toward the ceiling. Have them notice their breath and open their fingers on the inhale, curling their fingers over their palms on the exhale. 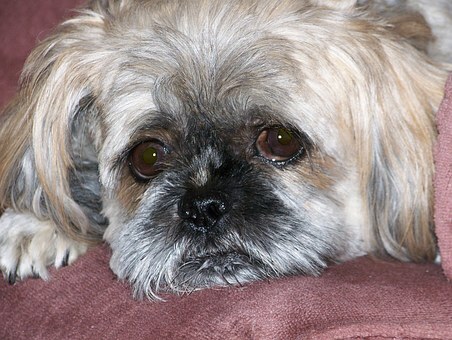 Gently guide them to notice their breath, and parts of their body including feet, hands, shoulders, hips, larynx, etc. Have them notice what they see with their eyes closed. You might say "you may see patches of light, dark, or colors. Focus on one of the darker patches, and let it begin to grow back into your mind, cascading through your body, bringing your self energy passed your breath, letting your energy pool in your feet." After a moment, ask them to open their eyes when they feel ready, letting the light in the room fill their breath like the dark patch did when their eyes were closed. Ask for feedback on what they notice in their bodies or minds. For younger vocalists, pause and focus can be more challenging. Try this part of the warmup with a more active exploration of their environment followed by a few deep breaths and sighs. Guiding singers to center their bodies and bringing them toward awareness of the muscles used in breathing creates a healthy template for a singer’s breath. The first time we work through the sequence below, we pause to ask for verbal feedback, often building in smaller segments. 1) To begin, have singers stand, close their eyes, and notice how their feet feel pressing against the earth, and how the earth feels pressing against their feet. Ask them to notice the result of their breath in their feet. 2) Ask them to feel as if roots are growing from the bottom of their feet, and as if each inhale feeds root growth. 3) Ask them to feel their ankles moving in tiny circles, as if they have a hula hoop around their ankles. Notice the freedom they feel in their bodies even as their feet are grounded to the earth. 3) You can add hula hoops at different locations and in different directions including the knees, hips, ribs, and neck/head. 4) Go back to the dark patch in the eyes from Step 1, and feel as if the energy coming into the eyes feeds back into the breath, connecting to the root growth through the feet. 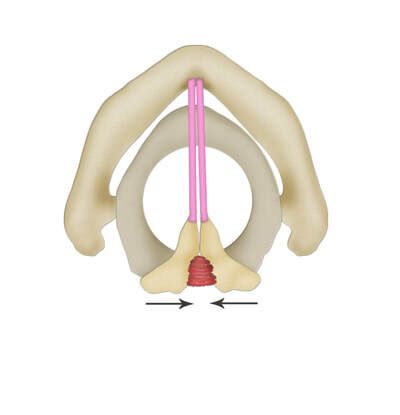 5) Notice how the body's suspension system is fed by breath and frees the body to feel more open to sound. 6) Add simple sounds like glides, or allow the circles to quiet, reminding them that the body is always in motion, and let the eyes open, letting light come into the body, feeding the breath into the ground. 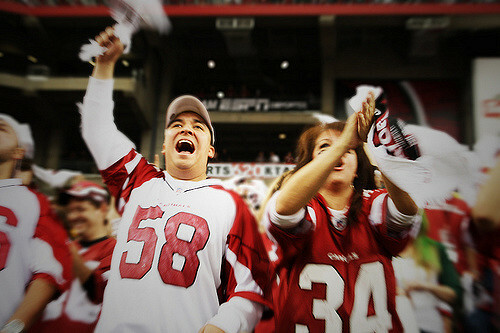 1) Wave at a friend across the room vigorously, and keep finding new friends to wave at. 2) Do "The Twist" or ask them to squish a grape with their feet individually or together. 3) Hop, squat, turn around. 4) Do them all in sequence fairly rapidly and add phonation at the end. The next step is to engage the body more fully to build awareness of muscular engagement. Have them breathe in over 12 counts, and then pulse (on [ʒ], [s], [h], etc.) for 8 counts, focusing on the kick-out muscle. Try to allow the larger abdominal muscles to remain less engaged as the kick-out muscle engages. To begin, placing a hand on the belt can remind singers where to focus their energy. Increase the intake to 16, 20, etc. counts. People tend toward habituated seating and standing postures that are less than optimum. 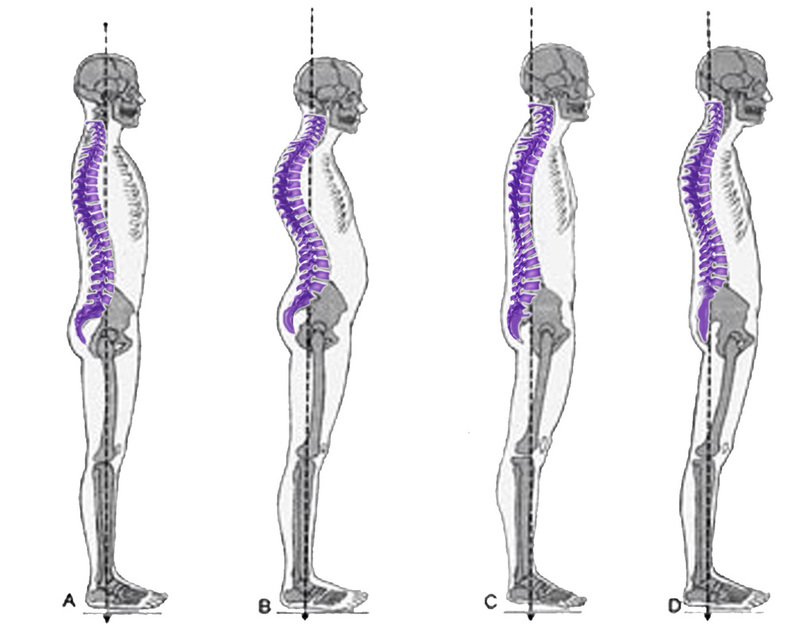 We often create more muscle tension by trying to enforce postural language like “stand tall”, “push shoulders back”, “raise the breast bone”, etc. To help singers find physical freedom, encourage them to think of the base of the torso ending below the hips, and to imagine the base of the torso floating above the center of their feet, while they look at something across the room. Noticing where they feel the result of their breath can help guide their body into efficient solutions. 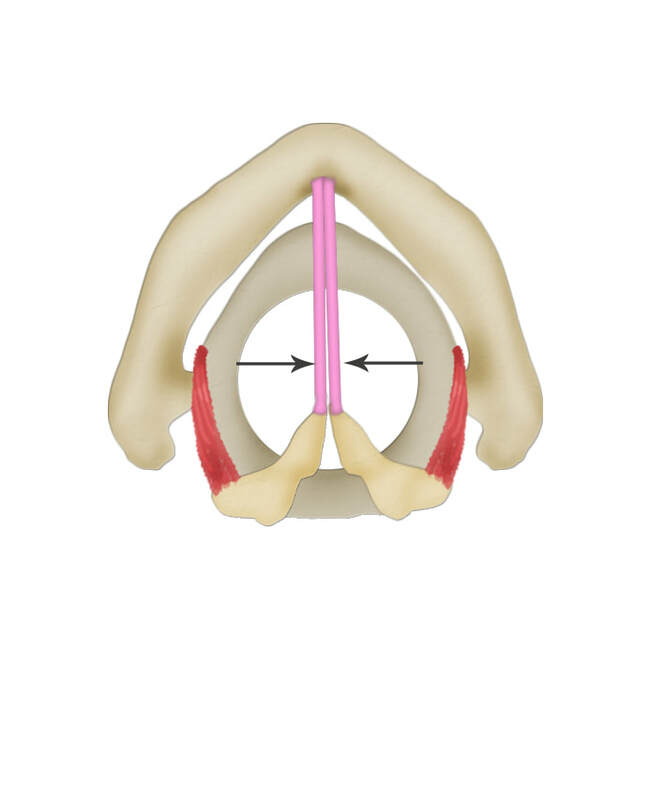 There are five muscle groups that coordinate through four functions that impact vocal fold vibration. From top to bottom in the above, these functions are: stretching (CT muscles), thickening (TA muscles), bringing together (LCA and IA muscles), opening the folds (PCA muscles). Vocal exercises can target these functions to aid overall coordination and effectiveness. 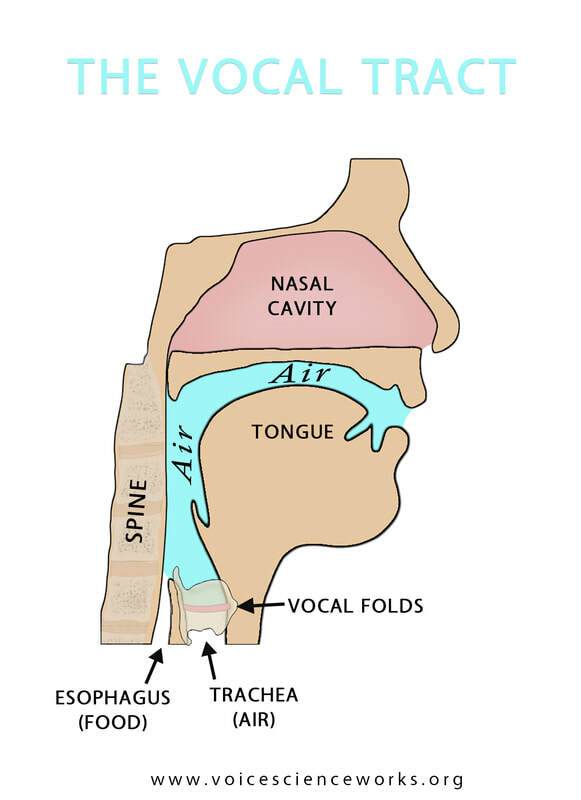 Below are several approaches that allow vocalists to focus on specific laryngeal coordination goals. 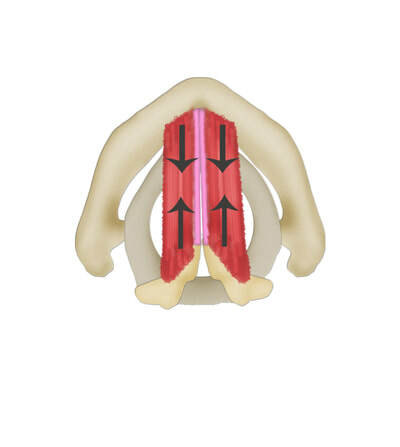 Visit our "Inside the Larynx" page for more information on laryngeal muscles. Larygeal coordination is made more easy when twang (see inertance) is added, so the use of the toddler whine ("I don't waaaannna!") with the owl ("whoooo") can be a nice way to begin focus on the larynx. Ask them to vocal fry, mouth closed, thinking an [ə] vowel to help focus the first energy boost of the vocal tract (see Harmonics vs. Formants for more). The vocal fry coordinates the opening and bring-together muscles (arytenoid) and thicken muscles (thyroarytenoid). Well-coordinated arytenoid/thyroarytenoid engagement is important for creating focused sound. Next, have them fry glide, allowing the pitch to glide slightly higher and slightly lower without changing the vowel shape. This engages the stretching muscles (crycothyroid), again, with the goal of clean coordination. The next series of exercises involve octave glides, which are important for coordinating all five intrinsic laryngeal muscles across the range. You can think of the healthy muscular coordination like seamless gear shifting in a car. Begin by singing several glides in the middle part of the range, allowing singers to repeat some octaves multiple times until their voices feel smooth and even. Spend most of your time in the middle of the range, gradually working to range extremes. Setting up the body to make sound is essential. Prior to singing a glide, have them imagine what the top note will feel like on the vowel they are about to sing, and then to breathe into the shape of that vowel prior to singing. The straw (or cup) is a wonderful tool for helping to stabilize laryngeal muscles because it provides acoustic back pressure, which allows the laryngeal muscles to work more easily. Simply place the straw between the lips, ensuring that no extra air escapes around the straw or through the nose, to maximize on back pressure. Sing an octave glide into the straw at normal volume, thinking an [u] vowel shape. We use the straw for many other exercises as well, including in place of words while rehearsing repertoire. Vocal acoustics are profoundly complex, but a little working knowledge can help choral singers to find new solutions quickly. For more on vocal acoustics, visit our Resonance, Harmonics vs. Formants, and Acoustic Strategies pages. You can think about the vocal tract as creating energy boosts in the sound. These boost are known scientifically as "formants." Learning to discuss the first two main energy boosts can open up a world of opportunity. 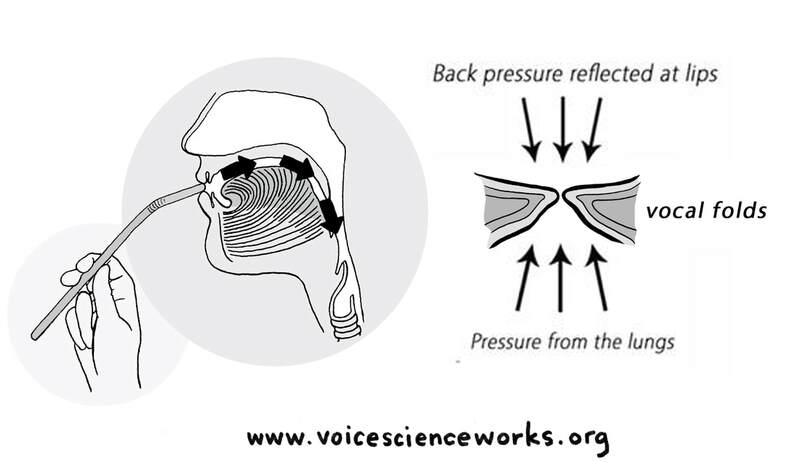 Structurally, the vocal tract can be thought of as columns of air, or, for ease, "the pitch of the air in the throat," (Formant 1=energy boost 1) and "the pitch of the air in the mouth" (Formant 2=energy boost 2). Each of these areas has measurable properties and distinguishable aural focus targets. When formant energy boosts align acoustically with the harmonics of the pitch being sung, the singer feels a boost of energy, stability, and volume. When the pitches of the harmonics from the vocal folds line up with the formant energy boosts from the vocal tract, the singer feels increased energy and stability. The first and strongest energy boost (Formant 1) is influenced by the entire vocal tract, but is often thought of primarily as occupying the air from the vocal folds to the base of the tongue. This area can resonate from around 200HZ to around 1200HZ (that’s roughly the pitches G3 to D6). Vocal pedagogy across stylistic lines tends to encourage stability in the first formant energy boost. The second energy boost (Formant 2) is influenced primarily by the area from hump of the tongue to the lips, and is shaped by the jaw, tongue, lips, soft palate, teeth, and hard palate. This energy boost has a wider frequency range including harmonics between 600HZ to 2300HZ. Much of the information that we perceive as vowel (e.g. upper harmonics) is shaped in this area. Note that there is overlap in the overall range of the first and second energy boost. The first energy boost will always be a lower frequency than the second. The ways in which these two frequencies combine define vowel to our ears. For example, an [u] vowel includes a first energy boost around 250HZ and a second energy boost around 800HZ. An [i] vowel, by contrast, includes a first energy boost around 250HZ and a second energy boost around 2300HZ. Vowel modification chooses cross combinations of these energy boosts to stabilize the vocal tract while maximizing on intelligibility of vowel perception. When singers focus on the “neutral” vowels of [I]=bit, [U]=bull, and [ə]=but, they stabilize the first energy boost, and increase their chances to find acoustic mix, which then influences the vocal folds into a more medial posture. All of this leads to increased blend and balance. Note that at the higher extremes of the female range, the neutral vowel will change to more of an [a], or even [ae] above B5. Encourage singers to allow for these changes to easily occur, rather than causing them to happen. Exercise 1: Choose any of your favorite exercises, and sing them on “bit” “bull” “but”. Use a 5-note downward scale repeated for all three, starting in the middle range. Have singers notice the degree of relative stability in their sound by noticing if their larynx moves, and if there is any change in their perception of the neutral vowel. Once they have internalized the concept, “replace” these neutral vowels with other ones. This is a mind trick, but works for almost anyone, since it allows for stability in the first formant, and clarity from the second formant. For the 5-note downward scale, you can have them sing “bean”, “boot”, “ball” (formant 2) while imagining “bit”, “bull”, “but” (formant 1). Once singers have a sensation of a stable first energy boost (formant 1) using neutral vowels, they can add the sensations of formant 2 that create aural clarity. Start with exercises that help to train the tongue into a forward position. 1) Have the students sing [Z] on an Ab 3 (men) or Ab 4 (women), thinking [I] in formant 1. 2) Have them notice where the tip of their tongue is, what part of the tongue touches the canines, and what the back of the tongue feels like. 3) After they give feedback, let them know the target: a general sensation of the tip of the tongue touching the back of the bottom teeth, of the front/middle sides of the tongue touching the canines, and of a lack of tension at the back of the tongue. 4) Use the glide on [Z] to establish this tongue position across the range, changing to [hUŋ] (“hung”) near the top of the staff to avoid tongue tension. 5) Use the [Z] glide up, open to a vowel on the top note, and glide down on that vowel. The same can be done with [r] and [ʒ]. Acoustic strategies open the vocal registration discussion beyond the head voice/chest voice dichotomy. Acoustic strategies relate to how adjustments in the vocal tract, primarily the first energy boost (formant 1), highlight selected harmonics. Whoop: The “whoop” strategy (first harmonic tracking) is indicative of aligning first energy boost (formant 1) with the first harmonic. People sometimes describe this feeling as light, heady, floaty, smooth, etc. The “whoop” is particularly effective for helping women to stabilize their sound in their passaggio and higher, and for men in creating a rich, warm sound in their mid and upper ranges. Hey: The “hey” strategy (second-tenth harmonic tracking) is indicative of aligning the first energy boost (formant 1) with the second-tenth harmonics. Lower singers will experience higher harmonics, but most people tend to focuse on H2-H4. The first energy boost aligns directly with one of these harmonics, and easily leaps from one to the next. People tend to describe this sound as easy (when in the lower part of their range), large, vibrating, powerful, brilliant, brash, etc. The “hey” can be helpful for all voice types when singing in their lower and middle range and when discovering volume. In popular music styles, it is essential to develop this acoustical registration into the upper part of the range as well. Acoustic Mix: The “acoustic mix” strategy (second-tenth harmonic tracking) is indicative of aligning the first energy boost (formant 1) between the second-tenth harmonics. Lower singers will experience higher harmonics, but most people tend to focuse on H2-H4. The first energy boost aligns between two harmonics, creating a "mixture" of the "hey" and "whoop" sounds. People tend to describe this sound as warm, round, tall, covered, smooth, rich, etc. The “acoustic mix” can be helpful for all voice types when singing across their entire range. Although approached somewhat differently, "acoustic mix" appears in all musical styles, and is the key to choral blend in most styles. It tends to be less intuitive for most people. When singers have an active understanding of these distinct acoustical strategies, they also find greater stability and power when registering in more complex ways. (see the Acoustic Strategies page). Bozeman, Ken. Practical Vocal Acoustics. Pendragon Press, 2013. One of our favorite games that we've created for feeling the contrast between "hey", "acoustic mix", and "whoop" is The Three Birds Game. First, quack like a duck, like, a really annoying duck. Put that on a five note scale if you want. Then, quaw like a goose on the same scale and really be the goose. Describe the difference that you feel. Lastly, coo like a pigeon, yup, on the same scale, and, again, describe the differences you feel and hear. Although this isn't a fool-proof method for achieving these resonant strategies (that is, your body still has to agree), if you've allowed yourself to play the part of the three birds, then you've probably noticed a significant color shift in your sound with each bird. These color changes tend to align with "hey" for the duck, "acoustic mix" for the goose, and "whoop" for the pigeon. Try alternating them as you rise and fall through your range and see how your body responds. Note: when being the duck, sometimes we can overly tighten our abdomen and throat muscles. This aligns with many people's experience with the "hey" resonant strategy. Try noticing if you can transfer your body's response to the pigeon over to the duck for greater ease across all birds. Gliding on a “hey”, like [ae] and [e], is effect for creating stability. Gliding on [u] helps to develop a sense of contrast between the “whoop” and “hey”. Note that men may have trouble with the "hey" higher than F4, and women, A4. Focusing on feelings of vowel stability across octave glides can help lead to the discovering of "acoustic mix". This exercise does a nice job of helping the singer articulate where the vocal tract adjusts easily for “hey” and for “whoop”. Focusing on feelings of vowel stability across octave glides can help lead to the discovering of "acoustic mix". One of choral music's most elusive animals, blend (and it's cousin, balance) can be largely achieved through adjustment of the first energy boost. This concept stands in direct contrast to the idea of "pure" vowels. To ask for a "pure" vowel typically leads singers to create the same vowel (e.g. 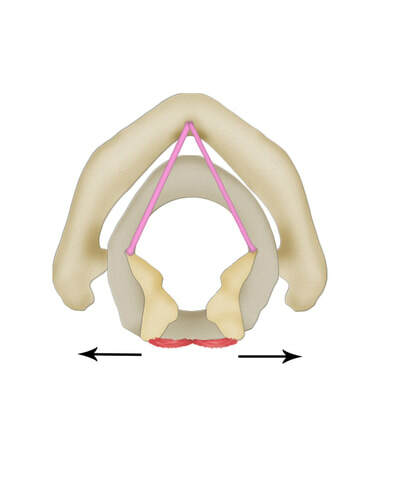 vocal tract) shape. The challenge with this lies with acoustic strategies. Vocal quality depends on which harmonic(s) a singer boosts. Vowel, on the other hand, is fairly flexible. 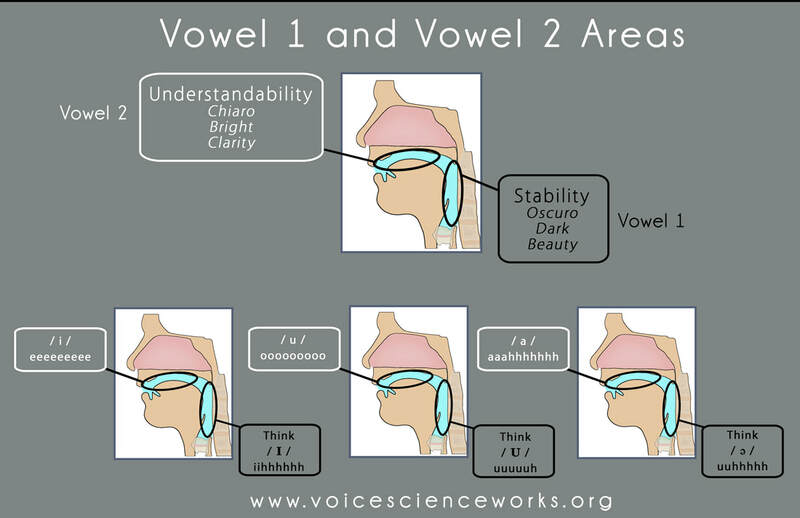 A singer's vowel shape can be radically different than the perceived vowel and still sound to listeners like the target vowel. See acoustic strategies (vowel modification) for more. For choral blend, singers will often need to create vowel shapes that seem radically different from singers in other sections. The choice of which vowel shape to create stems from the desired acoustic strategy. In most choral styles, acoustic mix tends to be the most desired target. When directors learn to guide singers toward vowel shape change, they avoid having to ask singers to tune ("tenors, the third is low"), sing softer ("altos, you're sticking out on that G#"), or lock in ("sopranos, listen to the chord"), among other choral challenges. This approach also yields positive results, as it encourages singers to create change rather than trying to take something away from their voice. These next three images show a G major chord with basses on G2, tenors on G3, altos on D4 and sopranos on B4. The smaller notes above each sung note represent the singer's harmonics and are numbered along the left-hand side. 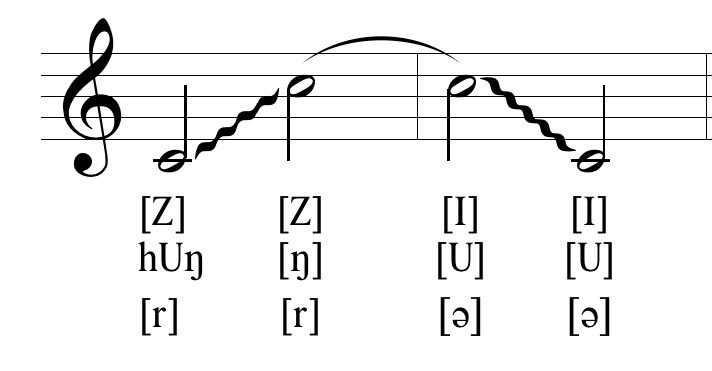 The vowel shapes on the right-hand side of the harmonics represent the first energy boost of the vocal tract (formant 1). Strange as it sounds, these shapes will lead to the first energy boost being more balanced, and to chord blending and balancing. It takes a little practice to find the vowel clarity such that the singers are singing the vowel shape while promoting the clarity of the target vowel. Lower notes, like the bass G2, that have more harmonic options have more vowel shape choices to play with as well. Note that, since the "acoustic mix" strategy can be achieved by the first energy boost existing between any two harmonics, the above vowel shapes focus on the lowest possible iteration of "acoustic mix." It is possible to play with others, and a fun and creative exploration. Starting with the lowest option, which tends to be the strongest, will help singers create a solid understanding of the aural effects produced. Note that, since the "hey" strategy can be achieved by the first energy boost aligning with any harmonic above the first one, the above vowel shapes focus on the lowest possible iteration of the "hey" resonant strategy. It is possible to play with others, and a fun and creative exploration. Starting with the lowest option, which tends to be the strongest, will help singers create a solid understanding of the aural effects produced. Some choral directors are regularly interested in vocal sounds with fewer upper harmonics. The "whoop" resonant strategy can be effective in creating these sounds. Challenges exist in the choral context in that the bass and often tenor notes are too low to truly create "whoop", since the first energy boost can't match the first harmonic. For sopranos who learn to maintain the low pitch first energy boost, as they rise in sung pitch, they often create what some people call "hard" or "laser beam" sound. This can be desired by some, but can also sound piercing to others. The result comes from maintaining the lower pitched vowel shapes like [u] and [i] on higher notes, thereby keeping the first energy boost well below the first harmonic. This causes the vocal folds to adduct in more extreme ways, leading to the focus in the sound that can be interpreted as piercing. It can also, in some cases, lead to the second energy boost being more prominent in the sound (because the first energy boost is too far away from the first harmonic), which can cause the second energy boost to align with the second harmonic, thereby creating a false "hey" strategy. Notice how for this style, the vowel shapes match more. Sign wave singing is as close as choirs get to creating "pure" vowel shapes. Choose chords to sing, choose words and practice changing vowel shape while making the word intelligible. Go back and forth from the modified vowel shape to the perceived vowel shape and notice how the modified vowel shape creates clarity and focus to the sound. In time, you can provide the singers with a chord and a target word and ask them to decide what vowel shape best helps them achieve the desired style. When we need to focus on certain techniques, or would like to challenge our singers a little more, we might use one of the following. Octave glide [u]-[o]-[a]: very helpful for women to create stability in their passaggio (men should participate in the same range if they are to sing, for acoustic strategy reasons). Have the women glide over an octave through their passaggio, allowing the vowels to change when they feel comfortable, rather than making them change. ​5-note downward [U]-[I]/[u]-[i]: good for establishing the first energy boost (formant 1) stability and connection to forward tongue position for the second energy boost (formant 2), and is helpful in creating a light, easy sound through the middle voice. Puppy whine or elf giggle: these sounds are great for coordinating stretch and thicken muscles, and using minimal pressure for producing higher notes. 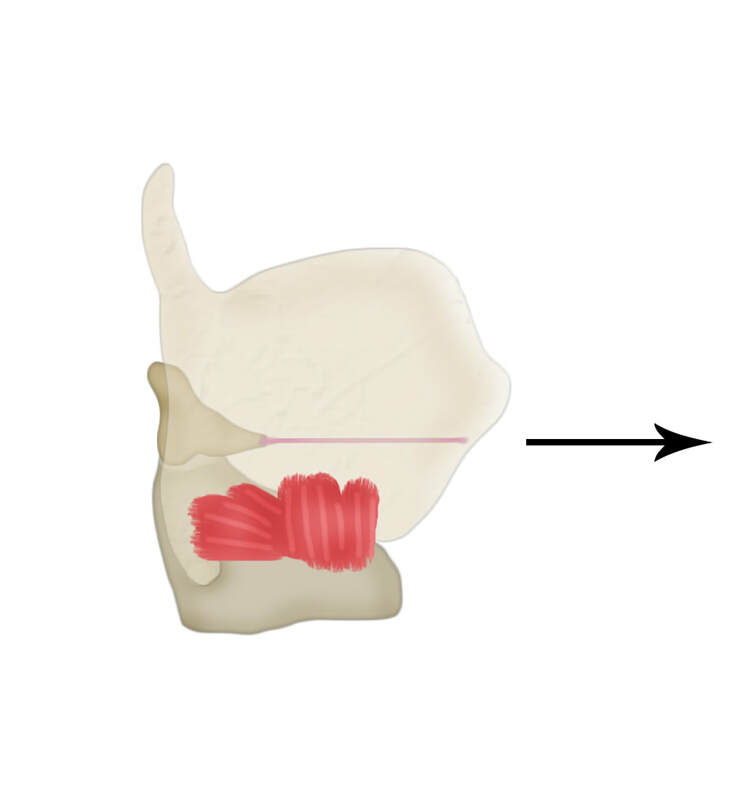 They can also address back-of-tongue tension often associated with transitions and higher areas of the range. Messa di voce: this is an effective measure of vocal tract and laryngeal stability. If a singer can messa di voce on a note, they have come close to mastering that part of their range. Lips: We often associate lip movement with tongue and jaw movement, but the lips can engage separately from the other parts of the mouth. To demonstrate this, have the singers sing an [o] vowel on an Ab 3 (men)/Ab 4 (women). Set it up with the [u] for the first energy boost (formant 1), and notice how the second energy boost (formant 2) shapes itself. While maintaining that shape, have the singers round their lips, then spread them, noticing how the sound changes, and what difficulties they might experience in maintaining the established internal shapes. Do the same exercise with [i] and [a]. Sing a 5-note descending scale on “bweh” to help encourage a soft lip position. Disclaimer: We have tried to give credit to all of the images that we've used that are not our own, or believe them to be in public domain. If you see something that is yours that you feel is being used without proper permission, please let us know and we will gladly credit you or remove it. Thanks for your help!